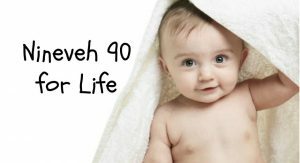 An Invitation: Join in Prayer with Nineveh 90 For Life! What is Nineveh 90? This is a 90 day effort of intensive prayer to end abortion, to increase in personal holiness, to seek the grace of conversion for loved ones, and for our other personal intentions. This is what “Nineveh 90 for Life” is all about. This a prayer campaign for resolute spiritual “WARRIORS! !” who seek to join ranks with tens of thousands of others in this “Supernaturally Charged” 90-Day crusade to deal the last blow to the culture of death. The research in the behavioral sciences says 90 days is about the time needed to change bad habits. Special Forces Prayer Warriors (those who join) will be challenged to enter into a period of prayer and mortification. “Mortification,” at its essence, means to “die to yourself.” This will be our time to let go of bad and sinful habits and to embrace more good and healthy and Godly habits. Please join in with about 50,000 others in storming Heaven with our prayers and sacrifices!